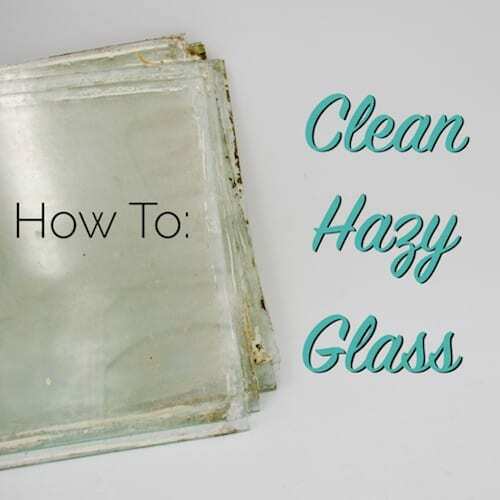 How do you clean hazy glass? If you’ve got an old house I’m sure you’ve asked this question before. It’s amazing how nice clean, sparkly glass looks. After staring through grimy windows for years, when that old wavy glass is brought back to its original shine it totally transforms your window’s appearance and the feel of a room. You might think a simple glass cleaner is the key- and while those can help, there are better ways to get a more beautiful shine with simple products like I’ll discuss below. Don’t miss the quick video below showing you the techniques and results of cleaning. You can use these techniques both in place and if you have your glass out during the window restoration process. Most folks need to clean their glass in place rather than having it out on the table like you do during window or door restoration, but the process is the same, except that its a little harder to reach. As long as you can safely access the outside of the window, then you can do this full “de-hazing” process. If you don’t have good access to the window, then a simple washing is really all you can expect unless you plan to pull the sash out to restore your windows. Rinse the glass with simple dish soap and water first. You can really drench it rather than just a light misting. This will start softening the built up grime and dirt. Grab a flat razor blade or better yet a glass razor scraper and scrape across the surface of the glass. This will remove dirt, grime, paint over spray and a majority of the gross build up. Be careful not to gouge the putty or dig into and parts of the wood. Rinse with some clean water and wipe the glass clean and dry it with a clean rag to gather any of the left overs. If the glass looks fine, you can stop here, but if you still have a hazy appearance, then move onto step 4 below. To get rid of stubborn haziness and built up mineral deposits, you need a glass polishing compound like CRL Sparkle which you can find in my store. We polish all of our glass because it really gives it a shine. Think of it kind of like getting your car’s headlights polished. It lightly abrades the surface polishing off imperfections and haze. With a clean rag, apply the polish in a circular motion much like waxing a car. Really work it in hard and rub the surface good to remove the build up. Let it air dry until it develops a hazy, white appearance and then buff it off with a new clean rag. Once you have all the residue off, you should be left with a shiny new piece of glass!